Willie McKim was a joiner to trade and a hard-working Committee Member over the years. 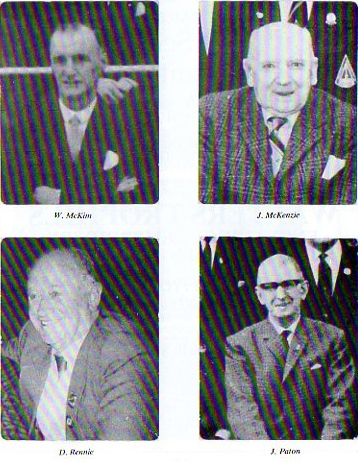 Jack McKenzie was a Past President of the Club, holding that post in 1938, 1939, 1945 & 1946. Both were honoured with 50 years’ membership games. Jim Paton (Past President in 1954, 1955, 1956, 1966, 1967 & 1977) and Donald Rennie (Honorary President) played in their 50 year games and both also achieved a remarkable 60 years’ membership game in their honour.